What is Demand in Economics? And What are the Determinants of Market Demand for a Commodity? Gossen, a German economist, is the first to explain the law of diminishing marginal utility based on general observations of human behavior. Because of this reason, the law is further termed as ‘Gossen’s first law’. The law of diminishing marginal utility states that the utility derived from each successive unit of a commodity diminishes. To put it simply, even the most beautiful place of the world or the sweetest music can make you feel bored after certain stage. 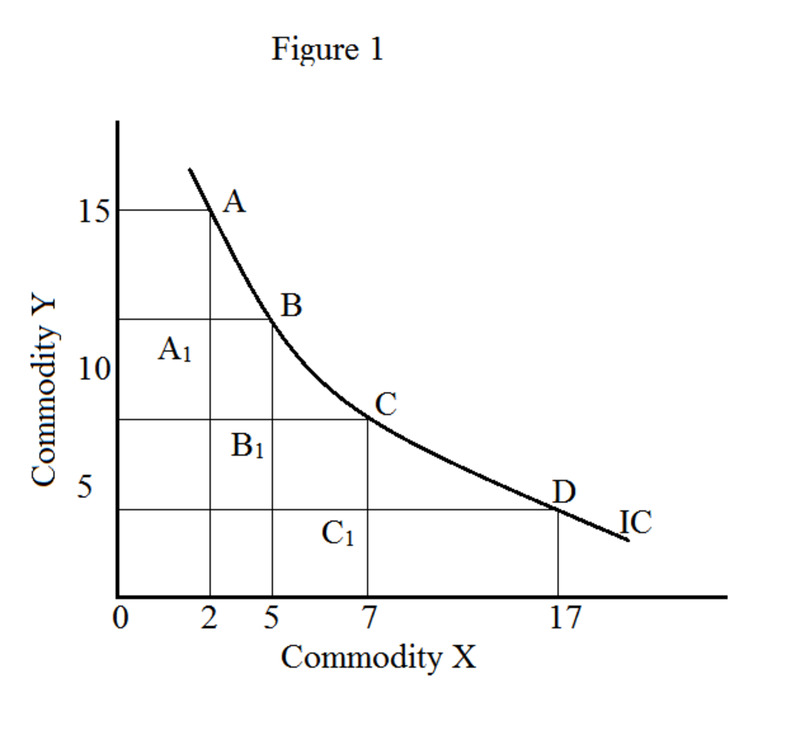 The law further states that when an individual consumes more of a commodity the total utility increases at a decreasing rate. However, after certain stage, the total utility also starts decreasing and the marginal utility becomes negative (See Table 1). This means that the individual does not need the commodity further. As you understand, an individual’s want for a particular commodity gets satiated when he or she consumes more and more of it. After certain stage, the individual is not willing to consume the commodity anymore. Because of this reason, the law of diminishing marginal utility is also known as the law of satiable wants. Each unit of the commodity under consideration is identical in all aspects such as quality, taste, color, size and so on. Each unit of commodity under consideration must be same and standard. For example, 100 ml of coffee, 200 grams of apple and so on. The law of diminishing marginal utility assumes that consumer’s consumption pattern, tastes, preferences, income, and price of the commodity and its substitutes are constant during the process of consumption. The law further assumes that consumption is a continuous process and there is no room for any time gap. Finally, for the law to hold well, the consumer must be a rational economic man. In addition, the law assumes that the consumer’s mental condition remains normal during the process of consumption. Suppose that you are hungry and plan to have some oranges. Since you are hungry, the first orange provides you with great amount of utility. The utility derived from the second orange is certainly less than that of the first orange. Similarly, the utility derived from the third orange is less than that of the second orange; the fourth orange yields you less utility than the third orange and so on. After certain stage of consumption, the utility derived becomes zero and beyond this stage, the utility derived becomes negative. This is because of the reason that you are getting satiated as you consume more and more oranges. When the utility becomes zero, it means that the consumer is not in need of the commodity any further. For better understanding, let us look at the following table. The figures mentioned in the table are hypothetical and the table represents the utility derived by a person from the consumption of oranges. Total utility, as the term indicates, is the utility derived from all units of commodity. Suppose that a person consumes 10 oranges. In this case, the total utility is obtained by adding the utility derived from each unit of orange. In our example (Table 1), the total utility derived from the first six oranges is 21 (21 = 6 + 5 + 4 + 3 + 2 + 1). Marginal utility is the utility from a successive unit of commodity. 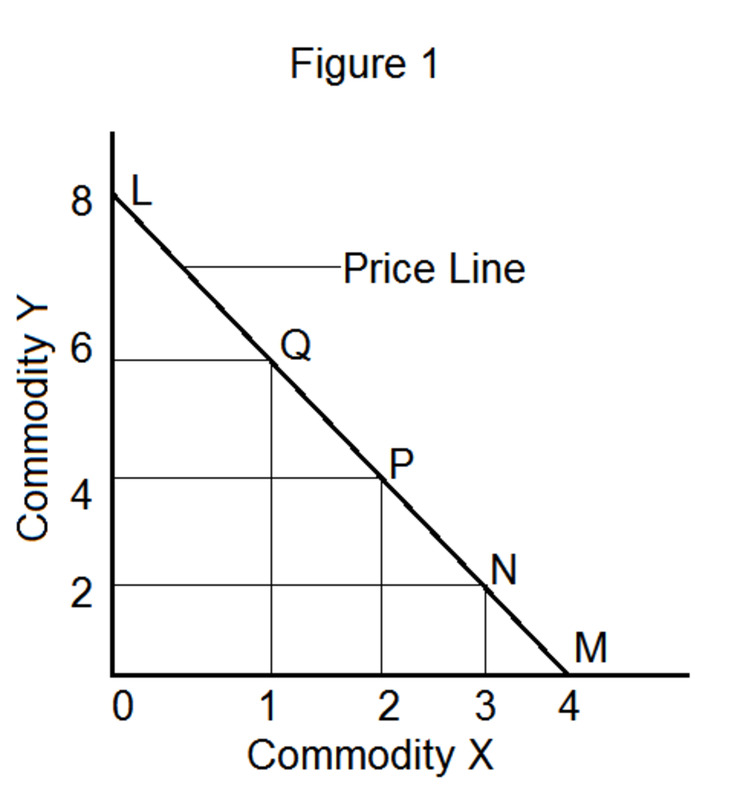 To put it simple, marginal utility represents the utility derived from each unit of commodity under consideration. In other words, marginal utility of nth unit of commodity A is the difference between the total utility of nth unit and the total utility of (n-1)th unit of the commodity. 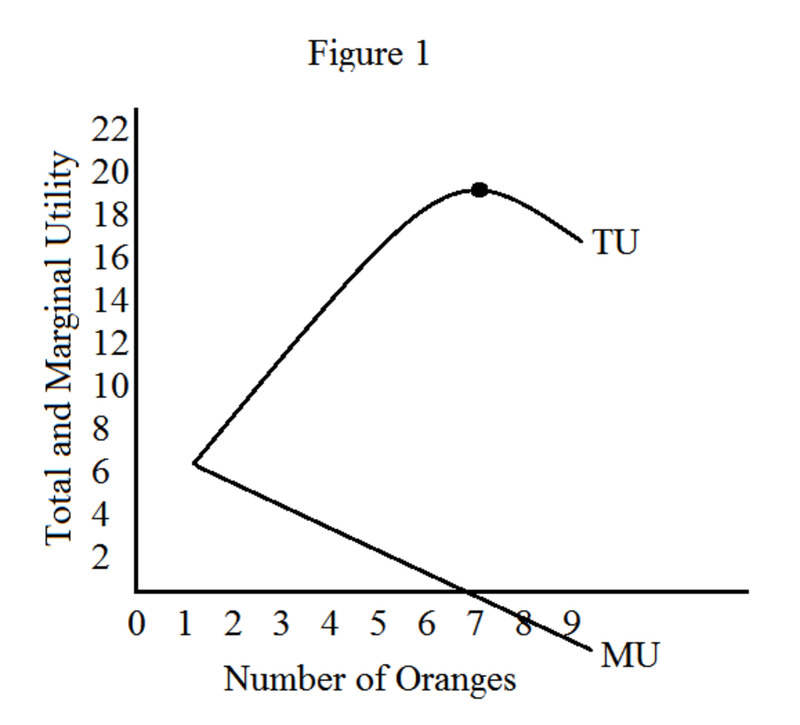 In our example (Table 1), the marginal utility of the 4th orange is MU4 = TU4 – TU3 = 18 – 15 = 3. 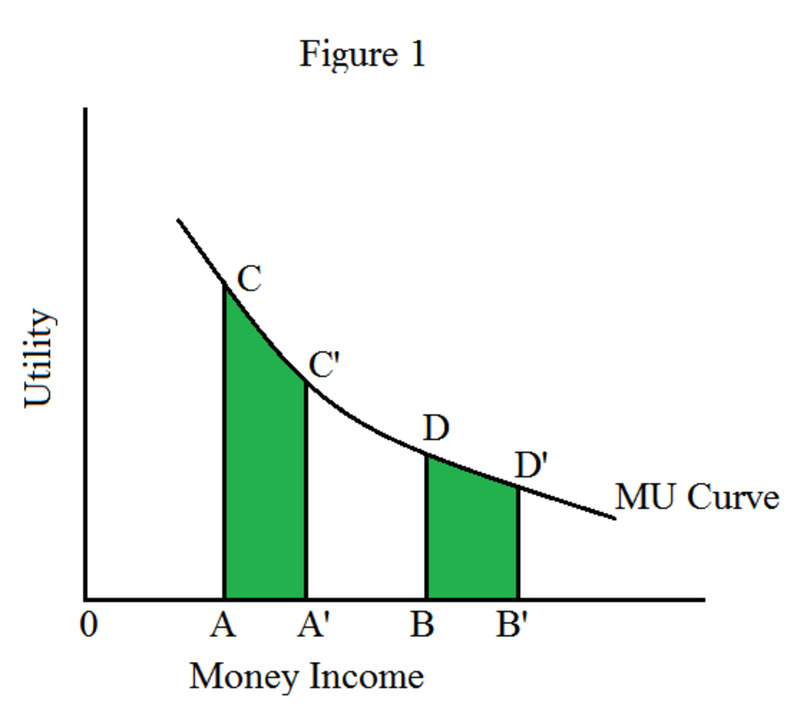 The figure 1 details the path of total utility and marginal utility curves. The total utility curve rises initially and after certain stage, the curve starts declining. At this stage, the marginal utility curve enters into the negative zone. The law claims that the marginal utility diminishes as quantity consumed increases. In some cases, the marginal utility may keep increasing in the beginning. However, a stage certainly comes at which the marginal utility starts decreasing. The law is relevant only at this decreasing part. Why does the marginal utility diminish? Firstly, human wants are satiable. Though you are an ardent lover of movies, you cannot watch infinite number of movies. At certain stage, you are bored of movies. Because your want is getting satiated as you watch more and more movies. This is the fundamental reason for the operation of the law of diminishing marginal utility. Secondly, each commodity is unique in the usage. This means that commodities are not perfectly substitutes. When you are satisfied with one commodity, you switch over to another because of their unique usages. When you try out something new, the utility derived from the first unit is high and the subsequent units give you less and less utility. Therefore, the law of diminishing marginal utility operates. Had all commodities been perfectly substitutes, there would be nothing new to excite you. In this case, law of diminishing marginal utility does not operate. Are there Exceptions to the Law of Diminishing Marginal Utility? Abnormality in individuals prevents the law from working well. For instance, misers or drunkards are considered abnormal here. Additional units of toxic substance may yield increasing marginal utility to a drunkard. In this scenario, the law of diminishing marginal utility does not work. Similarly, a miser may get increasing marginal utilities by acquiring more and more money. However, this argument is ruled out because the law assumes rationality in human behavior. Some people may involve collection rare articles such as antiques, stamps, old paintings, coins and so on. Under these circumstances also, the law of diminishing marginal utility does not hold good. Similarly, some people purchase goods such as jewels and diamonds just to display them in order to uphold their social status. In this case, the law of diminishing marginal utility does not operate properly. When many people start using a commodity, the utility derived from it starts increasing. For example, when you alone use a mobile phone, you may not find it much useful. If all your friends start using mobile phone, you will start using yours frequently. In this case, the utility you derive from your mobile phone start increasing, when others start using mobile phone. Therefore, there is no possibility for the law of diminishing marginal utility to operate under this circumstance. Not in a simple language you explain ......You used the scientific and technical language. ..